IQ's Corner: CHC cognitive-achievement relations project finished! It is done! CHC cognitive-achievement relations project finished! It is done! 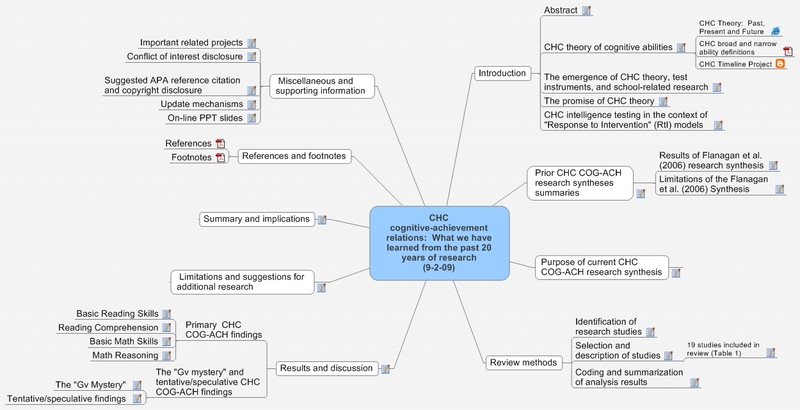 I'm pleased to announce the completion of the Cattell - Horn - Carroll (CHC) Cognitive Abilities-Achievement Research Synthesis project, a project first described in a prior post. The purpose of this project is to systematically synthesize the key Cattell-Horn- Carroll (CHC) theory of cognitive abilities designed research studies that have investigated the relations between broad and narrow CHC abilities and school achievement. The project can be accessed via a clickable MindMap visual-graphic navigational tool (similar to the image above...but "active" and "dyanamic") or via the more traditional web page outline navigational method. You can toggle back and forth between the different navigation methods via the options in the upper right hand corner of the respective home web page. Feedback is appreciated. I request that feedback be funneled to either the CHC and/or NASP professional listservs, mechanisms that provide for a more dynamic give-and-take exchange of ideas, thoughts, reactions, criticisms, suggestions, etc. This project, in a briefer journal form, is currently "in press" in a special CHC issue of Psychology in the Schools (McGrew & Wendling, in press). IQs Corner is official !!! !